Take advantage of the solar heat – During the day, use the solar heat to your advantage by opening blinds and curtains to allow the natural light and heat to warm up your house. 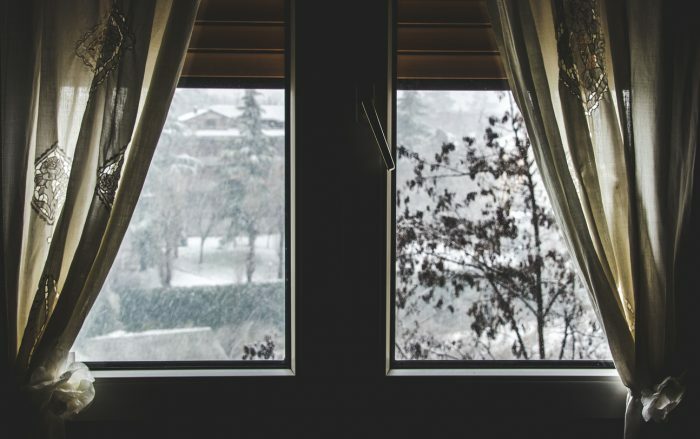 At night, be sure to close these curtains to help insulate your home against the cold. Between 10-25% of heating loss in the winter can be attributed to windows, so it is important to insulate windows and cover windows with blankets at night if they don’t have window coverings installed. Install plastic window treatments – In order to reduce the amount of heat lost through windows, you can install plastic window treatments to help insulate your home and keep drafts out that allows heat to escape. These treatments can cost as little as $5.00 and can drastically reduce heating loss in your home. Minimize using bathroom and kitchen fans – Bathroom and kitchen fans, although they are good at eliminating odours, are also responsible for eliminating hot air in your home. Keeping their use to a minimum during the winter months can ensure you are not removing heat from your home unintentionally. Ceiling fans – Increase the use of ceiling fans in your home this winter to help circulate warm air. Running a ceiling fan in reverse will force the warm air that has risen to the ceiling back down into a room, decreasing the amount of escaped heat. Furnace maintenance – Giving your furnace a quick tune-up, and ensuring you change the filter regularly can make your furnace run more efficiently, thus decreasing your overall heating costs. Furnace filters that are dirty cause your furnace to work harder and become inefficient, which can cost you in the long run. Clear dryer vent – A blocked dryer vent can actually allow cold air to enter your home. Be sure to check your dryer vent regularly to make sure your furnace isn’t having to work harder to heat your home than needed. Clear heating vents and radiators – Move furniture and clean around your heating vents to ensure that there is no blockage stopping the warm air you’re paying for from reaching you in every room. Don’t heat unnecessarily – Close the doors on unused rooms to avoid unnecessarily heating parts of your home that don’t need the heat. Install a low-flow showerhead – Updating your existing showerhead to a low-flow one can decrease the usage and overall costs of heating water. Weather stripping – Check around doors and entrance ways to see if the weather stripping is worn and needs replacing. Weather stripping doesn’t last forever and is a quick fix to avoid hot air escaping through these doors. Insulate – Add and replace insulation as needed to increase the heat remaining in your home. Lower thermostat setting – Use a lower thermostat setting at night when you’re sleeping, or if you plan to be away in order to save on heating costs. You can save up to 13% on your overall heating costs by programming your thermostat to 68 degrees during the day and lowering it to 55 degrees at night. Programmable Thermostat – You can minimize your heat use by adjusting your thermostat based on your home activities. Investing in a programmable or smart thermostat can simplify your thermostat adjustments, and allow your home to automatically adjust its’ temperature as programmed. A small investment running between $100-$300 for a smart thermostat can save you hundreds in the long run. Learn to wear socks – If your feet are cold, then your whole body will be. Reminding yourself to put on socks can drastically change your perception of temperature, and stop you from reaching for the thermostat. It is important to note that this is not a complete list of ways that you can reduce your heating costs this winter, it is but a beginning. If you are diligent in making some small changes around your home, you can drastically reduce your heating costs, all while keeping Jack Frost at bay. Save your heat, and your pocketbook this winter by being aware of where your home loses heat and make some necessary changes. Keep warm, and enjoy this snowy season!